My work in schools comes either as direct invitation from the school, or by selection, frequently through Creative Partnerships. I frequently share wood carving experience with the children by using plywood. This is easy to cut out using the card templates the children design. With my guidance, they carve incised surface designs on the plywood shapes which are then primed, painted [by the children, but not always] and varnished. 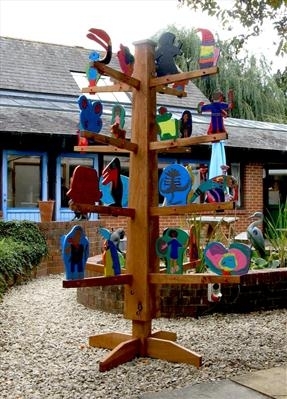 The Tree, which I make in my workshop, is the vehicle that carries the children's own work. It becomes a durable long lasting piece of Public Art. The shapes can be changed around to make different stories.